Patio Shades Retractable Awnings of New Jersey is a preferred supplier of high-quality, elegant, custom window shadings, awnings, patio room roofs, garden pergolas, sun/solar screens and canvas canopies. We specialize in providing New Jersey with customized awnings, window shades and door overhangs for commercial properties (condominiums, apartments, storefront entrances, industrial complexes and other buildings for business or investment). Through our website (www.PatioShadesAwnings.com) and from our on-the-ground location in Bridgewater in the heart of Central N.J., we serve all of New Jersey plus New York City and surrounding communities. Please call 908-259-4969 or 1-844-NU-PATIO (toll-free) or e-mail [email protected] with any and all of your awnings inquiries. However, we think many, most or all of your questions can be answered through our comprehensive Internet site, where you’ll find exquisite products of Italian design, immaculate construction courtesy American hands-on know-how, and – what truly separates Patio Shades from any other awnings distributor in New Jersey – total customizability. With capable assistance from our on-line Awnings Architect, PatioShades offers our customers a complete range of choice for color, size, style and fabric material, resulting in thousands of possible combinations – one of which is the best option for every window treatment and/or protection need, whether you need a small awning to invite customers into your shop, or a large awning to protect visitors and employees at your company. PatioShades Retractable Awnings of New Jersey has what you need at the cost you want. For our commercial, industrial or business clients, Patio Shades’ retractable window awnings help storefronts, restaurants and other foot-traffic establishments discover their own unique distinctive, attractive, finished look. For our residential consumers, Patio Shades’ retractable awnings provides your home with what is essentially an entirely new room, perfect for entertaining but protective enough from nature’s elements that you can feel comfortable knowing your kids have an escape from the weather without being cooped up indoors. PatioShades Retractable Awnings of New Jersey offers such a new level of freedom – all in the style and appearance you prefer most, all with a craftsmanship that rivals or exceeds any other awnings provider in NJ, NYC or elsewhere. 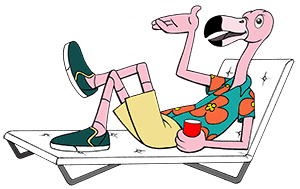 Here at PatioShadesRetractableAwnings.com, with the assistance of our on-line Awnings Architect and Frank the Flamingo, we team up to show you how to get accurate measurements of the space you wish to shade. Then, once you know the size you need as well as the style and color you want, your order gets placed, the materials get imported, our American work force puts it all together, and the final, totally customized product gets shipped directly to you. You can either install your new awning yourself, or contact Patio Shades to arrange for a New Jersey-based expert installer to visit your property and ensure a proper installation of your window or door awning. For comfort with a view…for patio rooms, for solar screens, for pergolas, for motorized and mechanical canvas awnings for your home, commercial edifice or company office, for absolute choice of personalization in your window awning or shading, for commercial or residential awnings comprised of the world’s best materials by the world’s best manufacturers, the sage choice is Patio Shades Retractable Awnings: Hand-Crafted, Above the Rest™. Call 908-259-4969 or 1-844-NU-PATIO, e-mail [email protected] and shop at www.PatioShadesRetractableAwnings.com. Gift certificates are offered – the gift of PatioShades awnings and protective coverings makes a wonderful, welcome surprise.